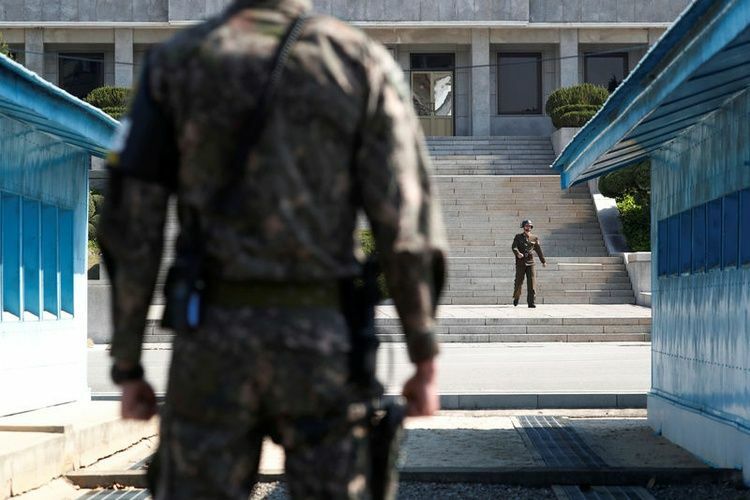 North and South Korea and the U.N. Command agreed on Monday to withdraw firearms and guard posts in the demilitarized zone village of Panmunjom this week, Seoul’s defense ministry said, the latest move in a fast-improving relationship. The three sides held their second round of talks at Panmunjom to discuss ways to demilitarize the border in line with a recent inter-Korean pact reached at last month’s summit in Pyongyang. The U.S.-led UNC, which has overseen affairs in the DMZ since the end of hostilities in the 1950-53 Korean War, was not immediately available for comment, but it said on Friday it supports the two Koreas’ efforts to implement their military deal. The announcement comes amid U.S. concerns that the inter-Korean military initiative could undermine defense readiness and comes without substantial progress on North Korea’s promised denuclearization. The neighbors are looking to withdraw 11 guard posts within a 1-km (0.6-mile) radius of the Military Demarcation Line on their border by the end of the year. They also plan to pull out all firearms from a Joint Security Area (JSA) at Panmunjom and cut to 35 each the numbers of personnel stationed there and share information on surveillance equipment. At Monday’s meeting, the three sides agreed to remove firearms and guard posts from the JSA by Thursday, and carry out a joint inspection over the following two days, the ministry said. The two Koreas have been removing landmines around the area as part of the agreement and they confirmed the completion of the demining operation at the talks with the UNC. “We discussed the timeline of the pullout of firearms and guard posts, as well as ways to adjust the number of guard personnel and conduct joint inspections,” the ministry said in a statement. The agreement also includes a halt in “all hostile acts” and a no-fly zone around the border. North and South Korea are technically still at war because the 1950-53 conflict ended in a truce, not a peace treaty, but relations have improved considerably in the last year. After his third summit in Pyongyang, South Korean President Moon Jae-in said the North was ready to invite international experts to watch the dismantling of a key missile site and would close the main Yongbyon nuclear complex if Washington took reciprocal actions. Those actions could include putting a formal end to the 1950-53 war, opening of a U.S. liaison office in North Korea, humanitarian aid and an exchange of economic experts, Moon said. But Washington demands North Korea takes irreversible steps to scrap its arsenal, such as a full disclosure of nuclear facilities and material.